Whoa! There are some great prices to be had for hungry diners at La Chaumière in Saint-Jean-sur-Richelieu, Quebec. Unfortunately, you're going to need a time-traveling DeLorean if you want to enjoy this food for these prices. 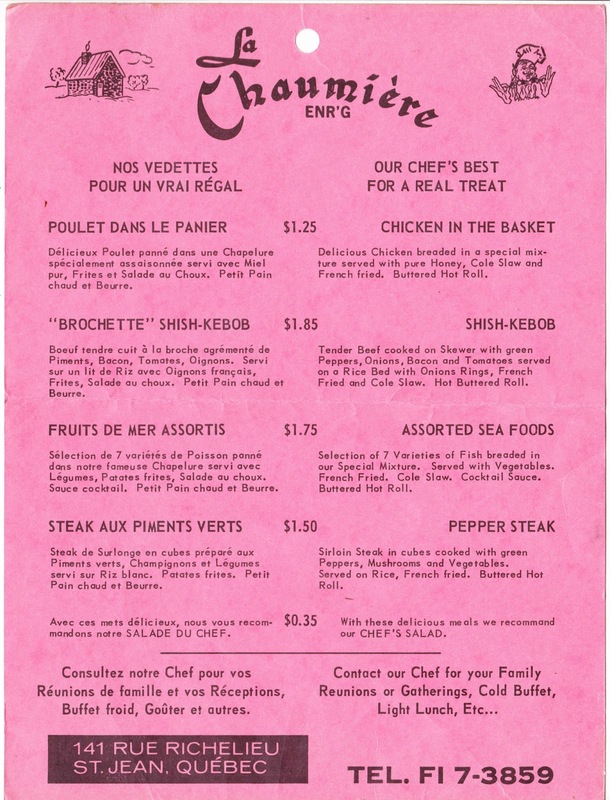 The menu, which likely dates to the 1960s, includes Fruits de Mer Assortis (Assorted Sea Foods) for just $1.75! The selection came with seven varieties of fish breaded in a "special mixture." On the side, you got vegetables, "French Fried" (which I'm assuming is "French Fries"), cole slaw, cocktail sauce and a buttered hot roll. If seafood didn't strike your fancy, you could try chicken in the basket for $1.25, pepper steak for $1.50, or, if you were looking to splurge, shish-kebob for $1.85. 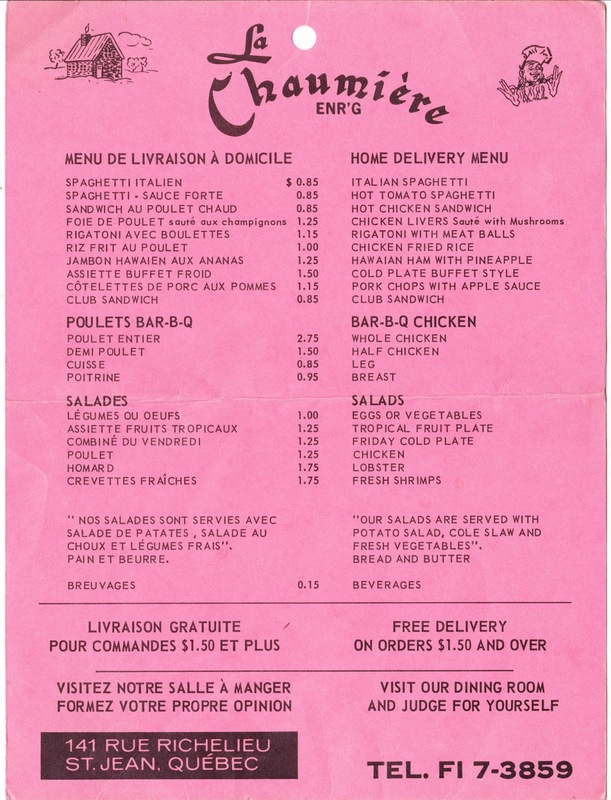 There was also an extensive home-delivery menu featuring spaghetti1 for 85¢, chicken livers with mushrooms for $1.25, chicken fried rice for $1.00, and pork chops with apple sauce for $1.15. Least Heat Moon did his best to devour the meal, but didn't have room for the bread. 1. I wonder what the difference is between "italian spaghetti" and "hot tomato spaghetti." 2. Michael L. Hess created a fabulous interactive map showing William Least Heat Moon's journey across the United States. 3. The aforementioned Hess revisits the story of the Swamp Guinea Fish Lodge on his blog Littourati (life, literature and maps). Also, there's a Swamp Guinea Restaurant in Hartwell, Georgia, that may or may not be the same establishment mentioned in "Blue Highways."